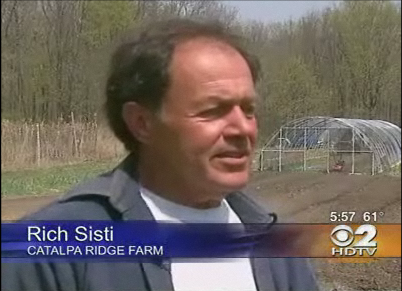 CBS-TV contacted us last month to do a story on CSA's and wanted to visit the farm & interview Farmer Rich. The story aired and you can watch it here! 4-14-2010 - the New greenhouse is done & filling up with plants! The new greenhouse is finished and we are filling it up with transplants. 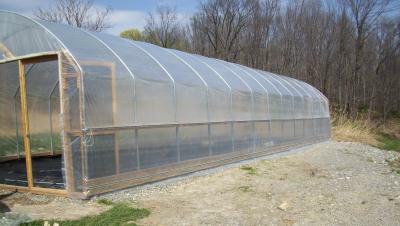 This greenhouse measures 17 'x 48' and after the transplant sales we will be building beds to grow greens, tomatoes, peppers & more. 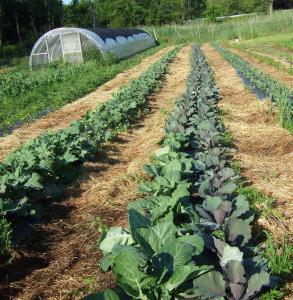 This is our 5th greenhouse and they really allow for diversification in growing. During rainy weather, we can work in the greenhouses (Farmer Rich hates getting wet!). Last year, our crew missed no work days due to rain, when it was the rainiest season ever.